let’s go canoeing on the Wupper! It’s necessary to pay in advance! 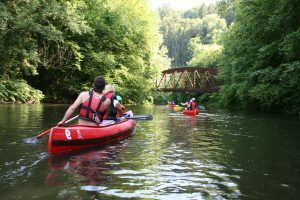 We will meet on the 27th of May at 11:40 at the station Historische Stadthalle to go to a guided Tour of 2 hours on our beloved Wupper. There will be a possibility to store your phone and purse safely and dry on the boat. Bagpacks can be given to the guides, who will bring a car. The bus leaves at 11:55.